Sigh. It’s been a busy couple of weeks. One of those times when you feel like every last minute of each and every day is planned out right down to the nanosecond. I’m not complaining – it’s good to be busy, but it does make it hard to get to certain things I really enjoy…like shopping for figs and writing this post. I had a few different ideas for the fig. At first a savory pie peaked my interest – I even made it as far as making the dough. I was thinking a little prosciutto, mascarpone, and balsamic would be glorious wrapped up in a flakey crust…but alas, by the time I got around to finishing the pie my poor figs had turned bad. (At least I now have some dough at the ready…it is apple pie season after all!) So back to the market and back to the drawing board I went. I realized the best part of the fruit is that it doesn’t need to be all dressed up to taste good. Simple I thought…keep it simple. To me – this is an ideal dessert – quick, beautiful and of course, scrumptious. Preheat oven to 400 degrees. 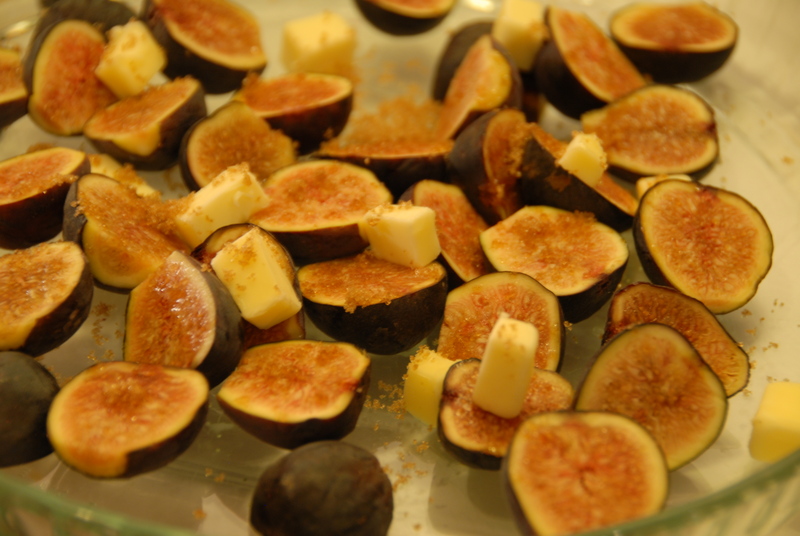 Slice the figs in half and arrange in a roasting pan or oven proof dish – sprinkle the brown sugar and butter over the figs. Roast for about 20-25 minutes or until they are plump and begin to caramelize. Meanwhile, whip the heavy cream to stiff peaks, (add vanilla and sugar to your liking once the cream reaches soft peaks) and set aside. 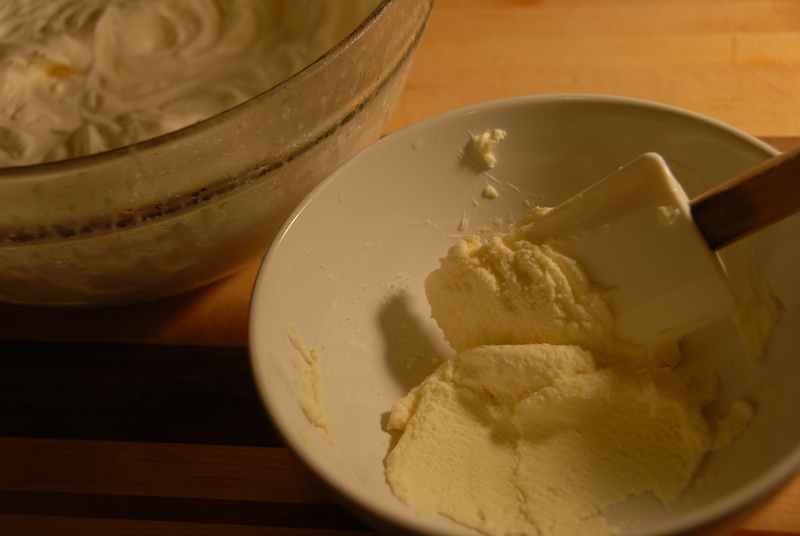 In a separate bowl loosen the mascarpone. Slowly incorporate the two – beginning with folding just a little bit of the whipped cream and then gently folding in the rest. Set aside or in the refrigerator. In a small saucepan bring the balsamic vinegar to a boil. Once it’s reached a boil turn down the heat so it is at a simmer. Whisk in the honey and vanilla. Allow the balsamic to simmer until is has reduced by about half and has turned into a syrup. This should only take a few minutes. 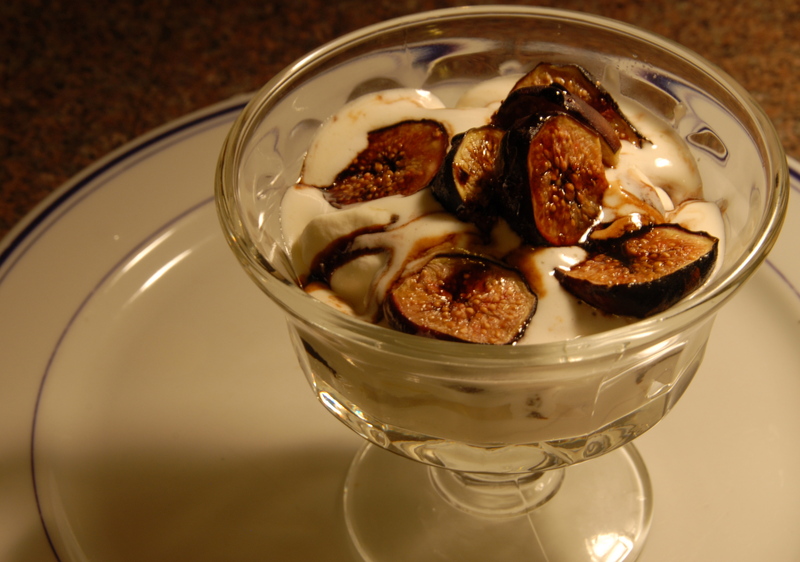 Assemble the desserts however you please…a good dollop of cream topped by the roasted figs and then a healthy drizzle of the deliciously thick and sweet reduction on top worked well for me. Heavenly. Just heavenly. 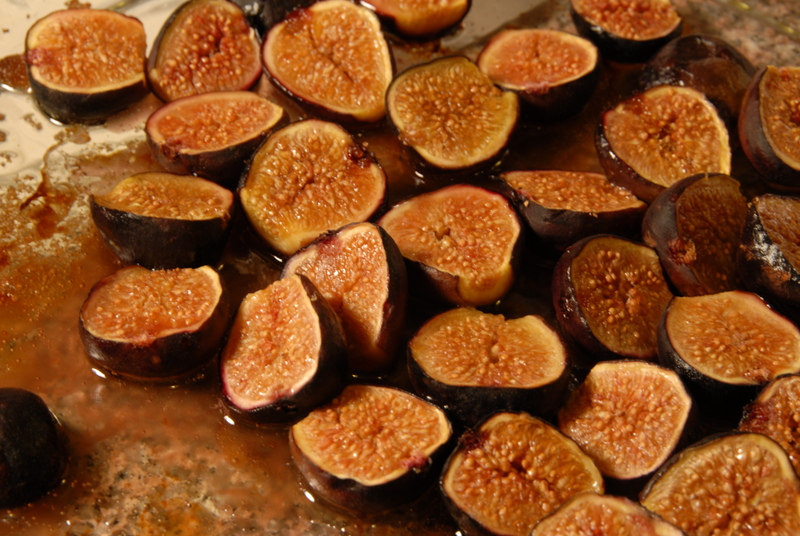 This entry was posted in Figs and tagged balsamic vinegar, dessert, figs, honey, mascarpone, reduction, roasted, vanilla, whipped cream. Bookmark the permalink.